Longshot was artificially created for entertainment purposes in the dimension known as Mojoworld. Bred for gladiatorial combat, he used his mystically acquired luck power to escape to Earth, where he joined up with the X-Men. Well, eventually - he wasn't originally intended to be an X-Men character. In fact, the solo series that introduced him was meant to be an ongoing, but low sales nixed that. And amazingly, since that first miniseries, Longshot has pretty much stuck with the same costume the entire time: a black leather jumpsuit with white cuffs and a shiny star on the chest. This figure really goes all out to duplicate the costume via painted highlights, but he also gets a new bandolier/satchel combo, and a knife in a sheath on his left leg. He gets his mighty space mullet, and two new hands: one clutching three knives, and the other throwing four more. With her ability to convert sound to light, Alison Blaire had a semi-successful career as a musician, but an attempt to jump to film was cut short by anti-mutant sentiment. She later joined the X-Men, where her laser beams were put to a better use. The way Dazzler is presented in the box is not her '80s look - with the leather jacket and the wavy hair, it's clearly her '90s costume. Yes, she was mainly off on Mojoworld during that period, acting as a freedom fighter, but she did guest in the comics every so often. 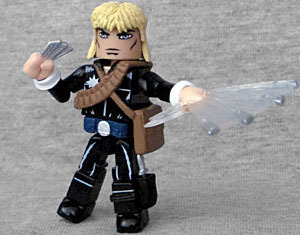 And since Longshot never changes his clothes, you could easily stand them with the Series 34 X-Men. But this series is all about the '80s, so the set takes care of that, too. 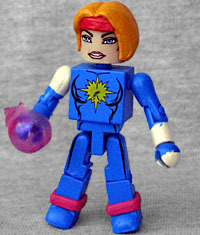 You can remove the jacket (and the jacket-based arms) and have a much more "plain" Dazzler. This outfit is kind of an amalgam of her first two blue costumes: the star being in the center of her chest rather than off to the left side comes from the second one, but that version also bared her midrif and left her legs uncovered from the knees down. Both costumes had the weird, mismatched sleeves though, so the replacement arms are perfect. She also has floppy '80s hair, and a pink energy blob. 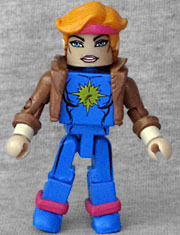 Dazzler and Longshot make for a nice pair of Minimates, but it does make me wish we had a Mojo for them to fight.